The Report exposes how every 28 hours someone inside the United States, employed or protected by the U.S. government kills a Black child, woman or man. These state-sanctioned killings are the casualties of what we call "Operation Ghetto Storm," a perpetual war to invade, occupy and pacify Black communities-- much like the U.S. invades and occupies the Middle East. 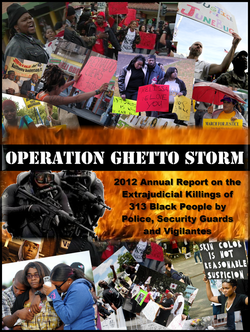 "Operation Ghetto Storm" written by Arlene Eisen, with preface by Kali Akuno, is published by the Malcolm X Grassroots Committee. It is also available, with other important resources at www.mxgm.org. Read the Report, talk about it, take action. When you use Chrome to download the Report on some computers, the photos do not reproduce correctly. If this occurs, please use any browser other than Chrome.